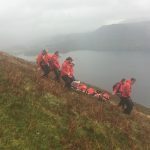 A group of four walkers having ascended Scafell Pike requested assistance when one of the party fell and injured their leg. In addition they were fatigued, and disorientated by the dark and misty conditions. After the KMR team arrived and an assessment made, the party were assisted down the hill to Seathwaite Farm.